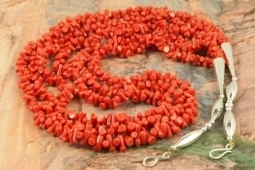 Stunning Necklace featuring 3 Strands of Genuine Coral. Finished with Sterling Silver Beads, Cones and Clasp. "As I sit creating, my spirit gives each piece a unique life of its own." - Lester Abeyta. 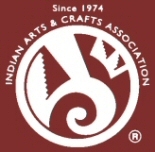 Lester Abeyta (Santo Domingo Pueblo) won first place in the Jewelry/Lapidary category at the IACA 2011 artist of the year awards. Lester is well known for his traditional stone and shell jewelry. His work is a reflection of the ancient techniques and styles of the Santo Domingo People, yet is fashionable in today's contemporary world. His parents, Richard and Delia Abeyta, taught Lester from an early age both the traditional and contemporary methods of lapidary art. All of his jewelry is hand made from raw materials utilizing both lapidary techniques. Each strand is 3/8" wide.